Ascending Butterfly: Tuesday, September 15, 2009 - Today's Words of Inspiration and TWO giveaways! Tuesday, September 15, 2009 - Today's Words of Inspiration and TWO giveaways! How do you measure worth? How much do you tie in what and how much you own, to how much you are worth? It's a tendency many people fall victim to. Your value is not in what you own, or how much of it you have. Your value is in what you give, what you share, the talents you possess that no one else does. The friendships you cultivate. The family who love you. The pets who wait eagerly by the window until you come home. Do something today that reminds you just how much you are worth. Do something today to remind those who mean the most to you, just how much they are worth! 1. Enter to win an Activeion Pro HERE (a $299 Retail Value!) This giveaway ends on September 25th, so get your entries in TODAY, and don't forget you MUST be a follower of Ascending Butterfly to enter this and ALL giveaways! 2. 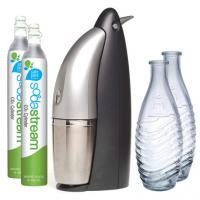 Enter to win the SodaStream USA Penguin Starter Kit - Your very own Soda Maker! Enter HERE (a $199 retail value!) This giveaway ends on October 12th, so get your entries in TODAY, and don't forget you MUST be a follower of Ascending Butterfly to enter this and ALL giveaways! Our September Book Club Title 'America Libre' by Raul Ramos y Sanchez will be launching shortly!